It has obviously been far too long since I’ve posted an update to let you know how my kittens are doing. Also, in lieu of actual words coming out of my brain, I thought I might show you some cute photos. They might make you feel better. I know they make me feel better. Seriously, Starfire does this thing where she climbs up on a lap and starts meowing, regardless of how much you’re already petting her, then shoves her face in your nose. It is awesome. There is nothing like a cuddly kitten to make you feel better. I think Jack would agree. Even the gerballs seem to have determined that the cats are harmless. 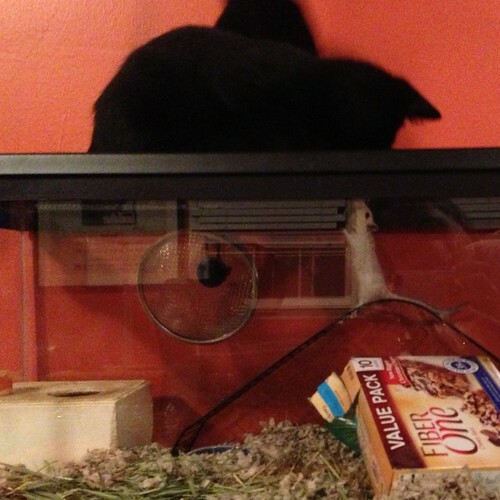 For a few days, they would hide when the cats climbed on top of their tanks. Now they just kind of hang out. Sometimes they even investigate the cats right back. 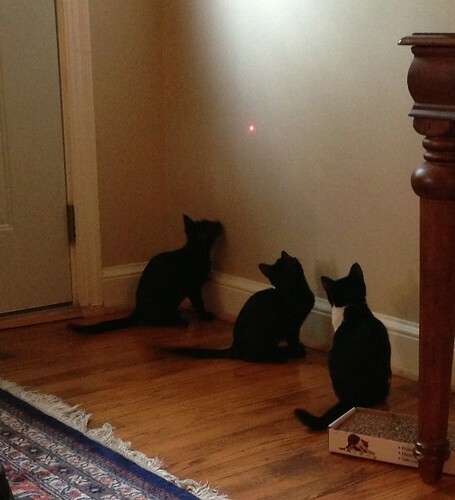 Or maybe they’re teasing the cats. Those gerbils have schemes. Either way, they seem pretty relaxed. 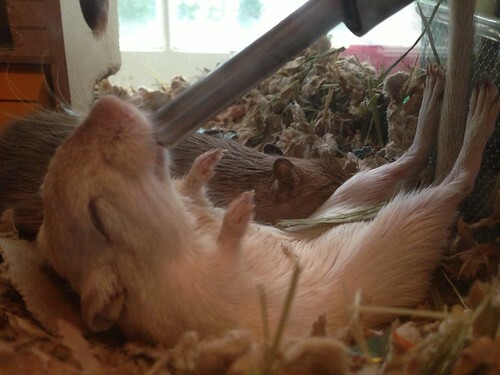 This gerbil, for example, seems to have found a way to hydrate whilst sleeping. RELAXED. The kittens, on the other hand, are anything but relaxed. I mean, sure, they sleep a lot, but they also stampede through the house in a manner that is quite possibly louder and more disruptive than when my kiddos do it. For tiny animals, their little padded feet are LOUD when they run. 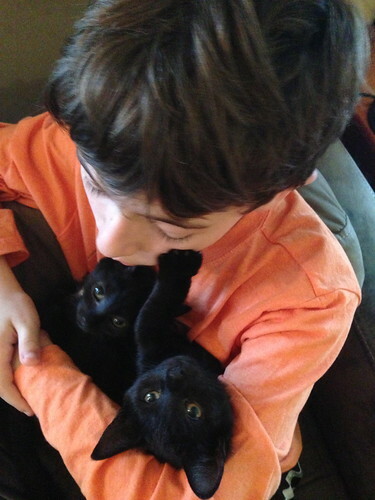 My kids are always trying to find new ways to have fun with/exploit the kittens, something that Quinn quite aptly did a few days ago when he went fishing for the phone and called my mom. He told her that he was having a kitty-a-thon and wanted to know if she wanted to pledge some money. AND SHE AGREED TO DO SO. AND SHE ACTUALLY SENT HIM FIVE DOLLARS. We took our kitty-a-thon proceeds (total: $5) to the store to find a cat toy. 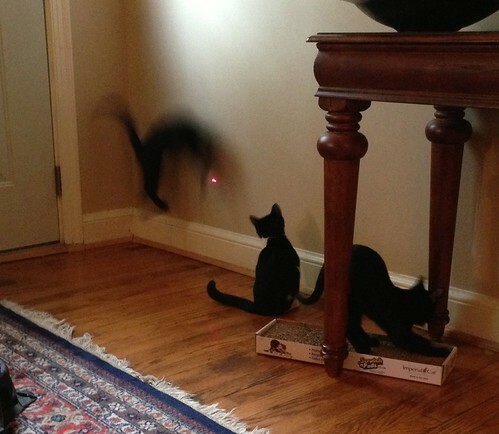 Jack and Quinn checked out all of the toys before deciding on a mouse-shaped laser pointer, which turns out to be the best $4.75 ever spent by anybody anywhere. The cats are powerless against it. And I can sit on my couch and exercise my cats at the same time, which is perfect for my current levels of lethargy. So, consider yourselves caught up on Team Stimey’s four-legged gang. 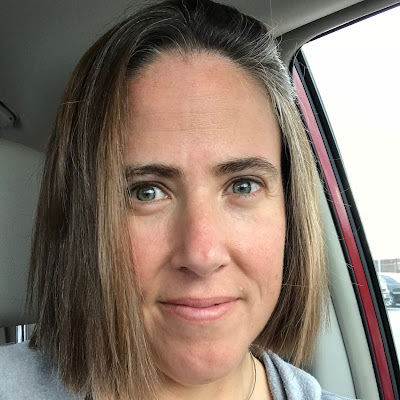 I’m going to try to do something exciting/fun/crushingly disastrous with my kids soon so I have something to write about that isn’t covered in fur.